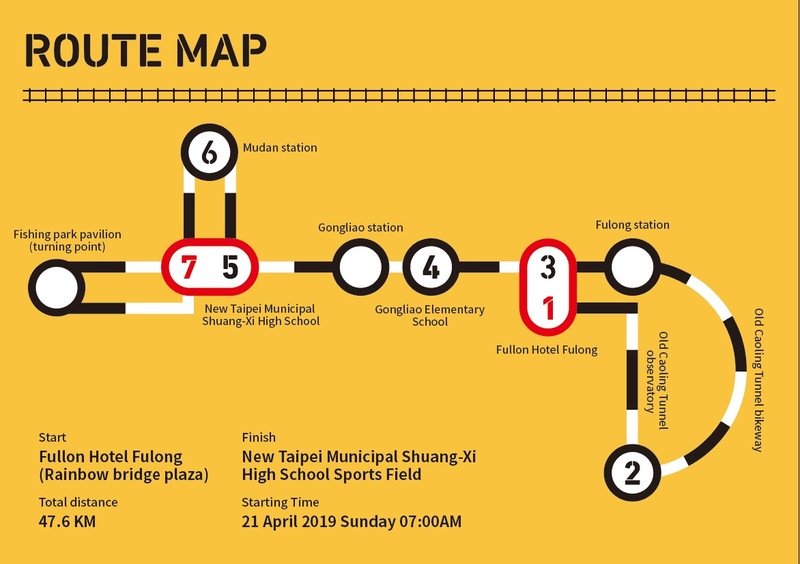 Running Holidays – New Taipei City Railway Relay is a one of a kind event that brings railway travel and sports together. The batons are designed as symbolic tokens that were used in the railway system, in which the token was passed from hand to hand, as in a relay race. Teams of 7 runners will be handing off the tokens at iconic spots nearby famous train stations such as Mudan, Shuangsi, Gongliao and Fulong. (1) The first runner of each team must be female. (2) Age limit: Born before prior to 21.April 2006. (3) Parents of the participants whose ages are 13 to 20 years old required to sign the parent agreement form upon registration. (4) Download and fill out parent agreement form. Fax to +886-2-8772-5010. (5) Team’s name has a maximum length of 8 Chinese characters or 16 English letters (One Chinese character equals to 2 English letters. Mixed languages are acceptable). Symbols are not allowed. (7) Each runner can run for only one team. If a runner registers or runs for more than one team. The teams are disqualified. ※ Finisher souvenir will be given to those complete the race within time limit. ※ Please show the bib to the staff to receive the souvenir. ※ Only one printed certificate is given to each team. Internet service for checking timing records and print service are provided at the venue. (1) The event takes place in the low carbon travel district. Trains or other low carbon transportation are recommended when traveling between race venue and hotels. (Racing) 7 runners in a team. The first runner must be female. (Cheerful group dress up themes) 7 runners in a team. The first runner must be female. (4) The race results of Smiling EMU800 fun run will not be included in the scores. (5) This event adopts a racing chip system to record the race results. Each slap bracelet contains a timing chip. Please be sure that your chip is fastened properly and to step on the chip timing mats located along the course route while running your race. B. April. 21 (Sun.) 5:00AM ~ 6:30AM at Information Tent (Start venue). (1) Online registration only. Maximum number of teams: 714. (2) Location: Tourist Information Center, Northeast and Yilan Coast National Scenic Area (subject to change). (3) If you are unable to personally check-in and pick up your race package, you may pick up your package at the start venue by 5:30AM on the race day. Those who cannot pickup the package on the race day may contact the executive unit to apply for cash on delivery in the following week after the race. Afterwards, the packet will be discarded.